The Trezor Model T (aka Trezor T) was released in May 2018. It’s the successor to the original Trezor (aka Trezor One) and features a full-colour touchscreen, faster processor, and superior cryptocurrency support. It looks great. But is it worth the cost? Is it the best hardware wallet available? In this Trezor Model T review, we’ll dive in and find out. Where Can I Buy a Trezor Model T? Summary: Is the Trezor Model T Worth It? The easiest way to securely store your cryptocurrencies. Supports Bitcoin (BTC), ERC-20 tokens, & 20 other cryptocurrencies. Upcoming support for Ripple (XRP) & Monero (XMR). Includes excellent password manager and U2F compatibility. Looks and feels a little cheap. The Trezor One was originally launched in 2014 by Satoshi Labs. This was the first hardware wallet on the market. 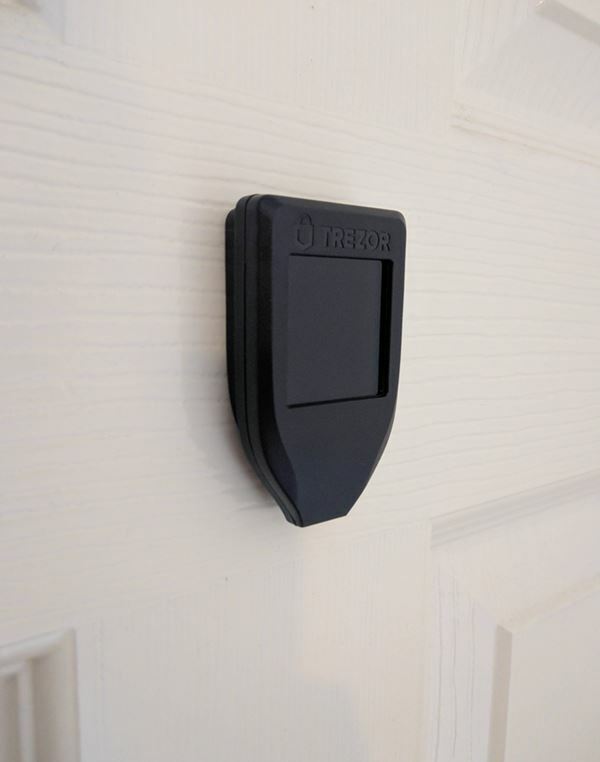 Their follow-up to this, the Trezor Model T, was released in May 2018. Hardware wallets allow you to securely make transactions. They achieve this by holding and signing transactions on this external device. This means that your private keys never need to be transmitted to your computer (which could be infected). Even if the Trezor was connected to an infected computer, your hard-earned cryptocurrency would still be safe. Hardware wallets are popular and well-recommended as they’re easy to setup and use (even for non-technical users) and provide peace of mind. 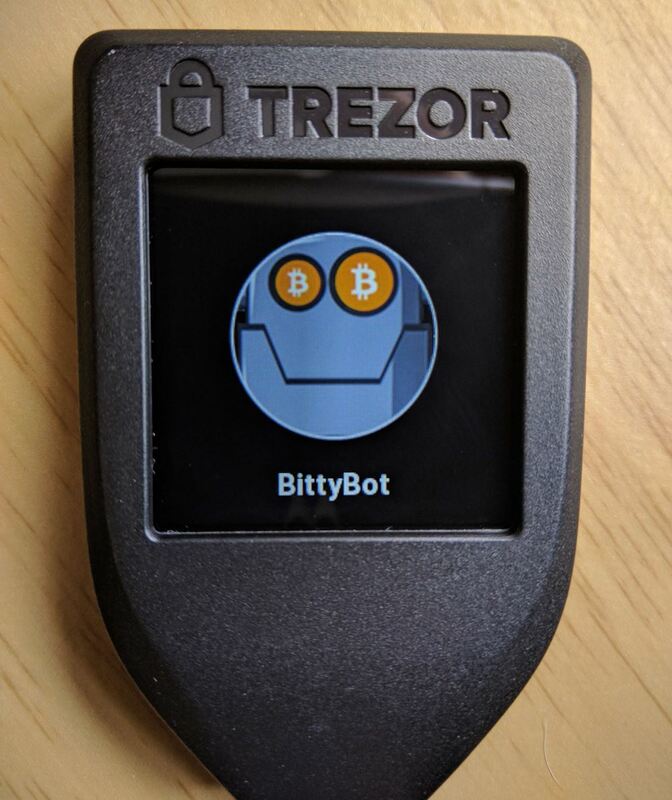 The Trezor Model T supports Bitcoin (BTC), Ethereum (ETH), Bitcoin Cash (BCH), Litecoin (LTC), and 26 other cryptocurrencies. It also supports all ERC-20 tokens. To double-check that your cryptocurrency is supported, check out this (searchable) list. The Trezor Model T doesn’t support any additional cryptocurrencies over the Trezor One. But that could change. 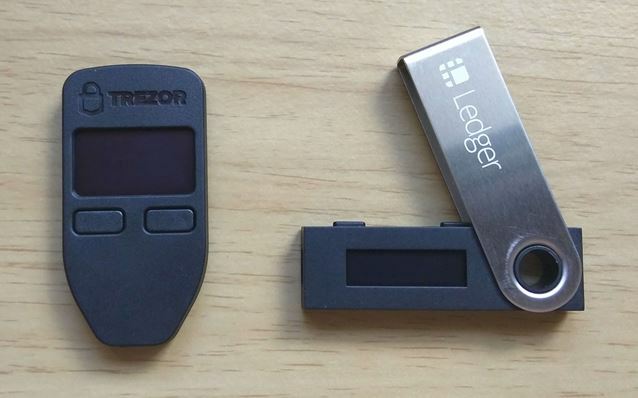 Some cryptocurrencies might only be supported on the Trezor Model T.
For example, it looks like Ripple (XRP) and Monero (XMR) will be supported on the Trezor Model T but not the Trezor One. Trezor advises that you should verify that the anti-tamper seal is intact. I think this anti-tamper seal is almost worthless. Tip: Once you’ve removed the anti-tamper sticker, just rub away the leftover gunk with your finger. This magnetic dock is a nice extra, but a strange inclusion. 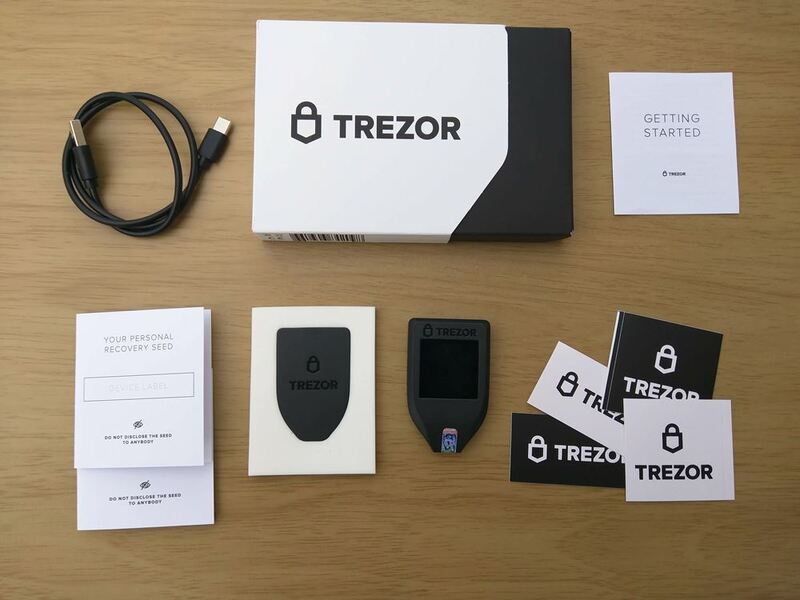 If you’re planning to store all your hard-earned bitcoin and cryptocurrency with a Trezor Model T, wouldn’t it be – to put it nicely – a little silly to have it docked somewhere conveniently? On the other hand, the magnetic dock does allow you to creatively keep it out of sight. Under your desk (or other furniture). Once stuck down, the dock – with the persuasion of a knife – can be removed. It didn’t leave any damage (on a painted door) when I tested it. It’s quick and easy to setup and start using your Trezor Model T.
Plug Trezor Model T into your computer. Cable should ‘click’ into the Trezor Model T.
While you should backup and set a PIN code ASAP, you aren’t forced to. You can immediately start sending and receiving cryptocurrency with the Trezor Model T if you want. Backing up and setting a PIN code takes about 5 minutes. This recovery seed is really important. In the event your Trezor is lost or stolen, you can use this recovery seed to access all of the cryptocurrency stored on your old device. As long as your PIN and recovery seed aren’t compromised, the loss of the device itself isn’t a big deal. Record your recovery seed on both recovery sheets (with a Sharpie). If you don’t do this, you might transfer an error from the 1st recovery sheet to the 2nd. Store each recovery sheet in separate locations so that you’ll still have a backup if one of the recovery sheets is lost or destroyed. You can create a PIN code which is 9-digits long. Make sure you don’t use a sequence and try not to repeat numbers. Trezor have some additional advice in this post. Like the Trezor One, I think the Trezor Model T looks and feels a little cheap. However, the full-colour LCD touchscreen (240 x 240 px) does redeem it. I had no problems using this either – it felt responsive and accurate. It’s also lightweight (16g) and about the size of my car keys (64mm x 39mm x 10mm). Compact enough to shove in my pockets or lose at the bottom of a bag. 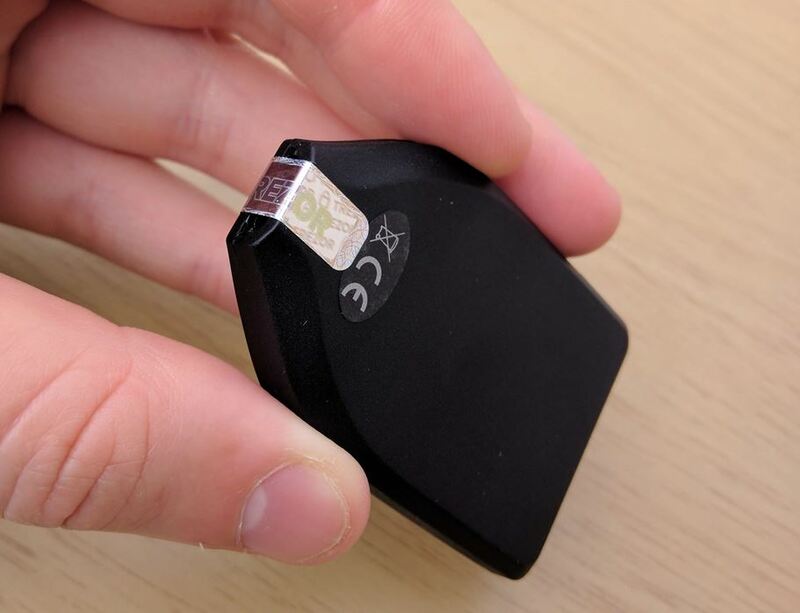 Let’s be honest: it’s not that important what the Trezor looks like – you’re not going to be flashing it around. The core functionality is more important. The wallet interface is clean, intuitive, and easy to use. Transactions: shows all your recent transactions. Receive: shows receiving address (and QR code) which you pass along to others. Send: enter address details (or scan QR code) of someone you want to send money to. Sign & Verify: prove and verify ownership of a bitcoin address. OP_RETURN: allows you to add 40 bytes of data to the blockchain. This post explains and explores OP_RETURN. Locktime: lock up funds until a defined block height. 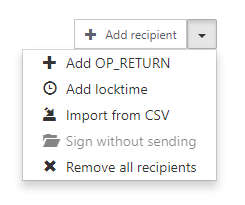 Add Recipient: send to multiple addresses with a single transaction (which saves fees). Import from CSV: allows you to import multiple transactions which need to be sent (which saves fees). Trezor’s password manager is a nice extra. It’s intuitive, easy to use, and works smoothly with no issues. But will you really use this? 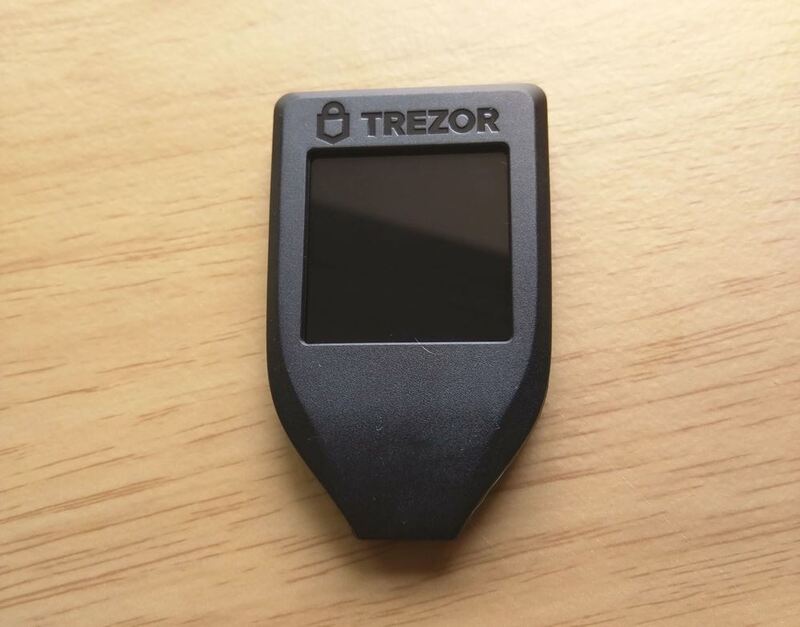 If the Trezor Model T was your only hardware wallet, wouldn’t you want to keep it tucked away? To make use of this, you’d have to keep it quite accessible. 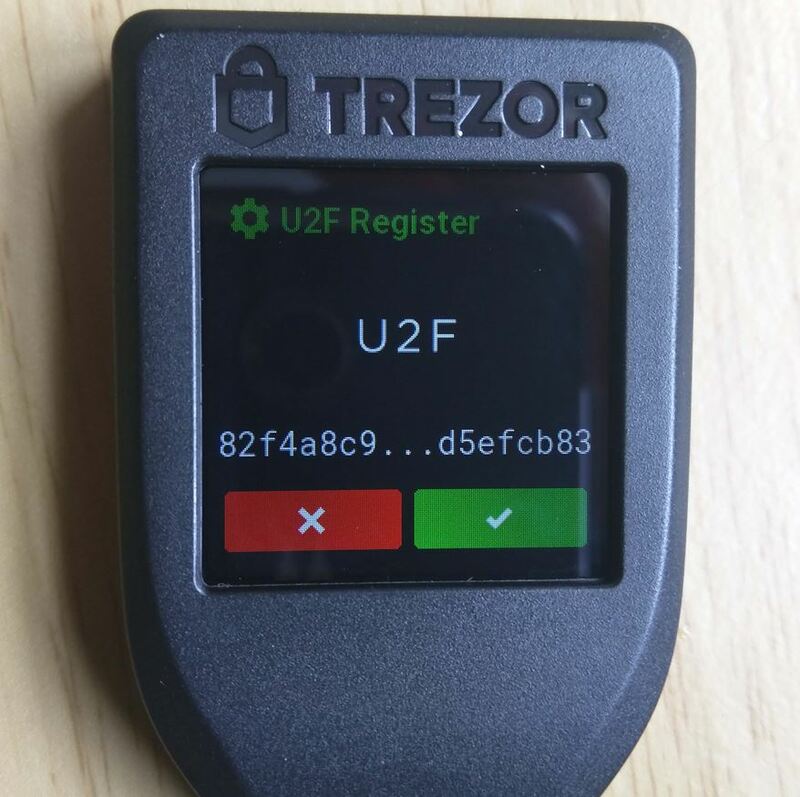 You can also use your Trezor device as a 2nd form of authentication (U2F device) when using some services. Universal 2nd Factor (U2F) authentication is like Google Authenticator (2FA), but more secure. Browse the full list of services which support U2F here. For setup details, check out this post. 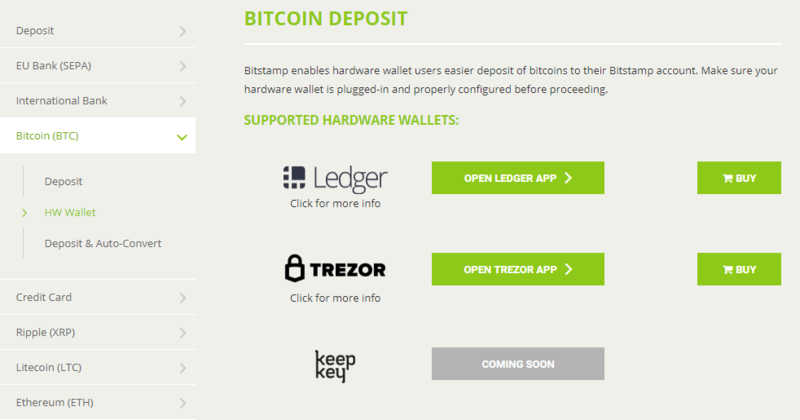 Some exchanges (e.g., Bitstamp) interact directly with the Trezor Model T. This allows you to directly deposit from the Trezor to the exchange without manually entering the transaction in the Trezor Wallet app. It’s just as secure but saves you a few clicks back and forth. To see how it works, check out this post. To find out about other integrations, check out this post. It’s a small touch, but I like that you can customise the device name and picture shown on the homescreen. You can choose from some included defaults or upload your own 144×144 image. In the wallet, click on your device. Upload or select an image from the gallery. The Trezor Model T costs around £177 (incl. VAT & shipping) from the official Trezor website. That’s about £64 more than the Trezor One and approximately £93 more than the Ledger Nano S.
For those from the UK, you may be charged non-sterling transaction and purchase fees when buying goods online which are priced in euros. For example, NatWest charges 2.75% in fees when purchasing goods/services online with a foreign currency. Trezor Model T has a full-colour touchscreen. You enter the PIN on passphrase on the Trezor Model T touchscreen. 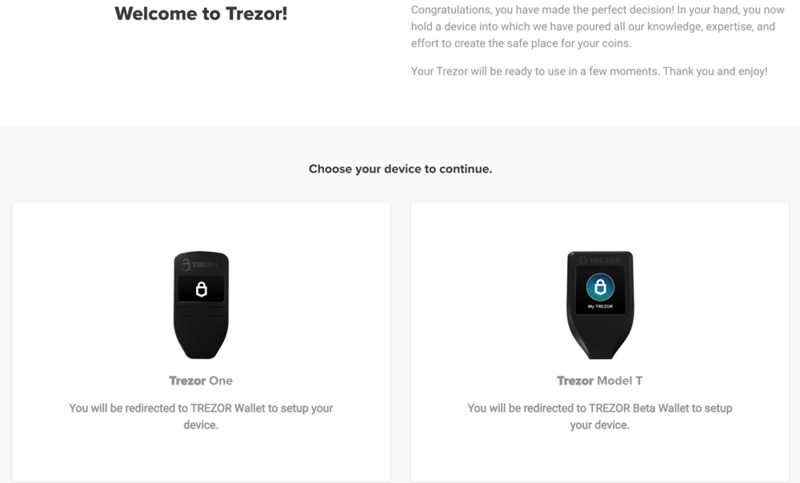 If you need to enter your recovery seed, you’ll do so on the Trezor Model T touchscreen. Trezor Model T has a microSD slot. The colour touchscreen is a significant upgrade. Unlike with the Trezor One, you can enter your PIN, passphrase, and recovery seed through the touchscreen. 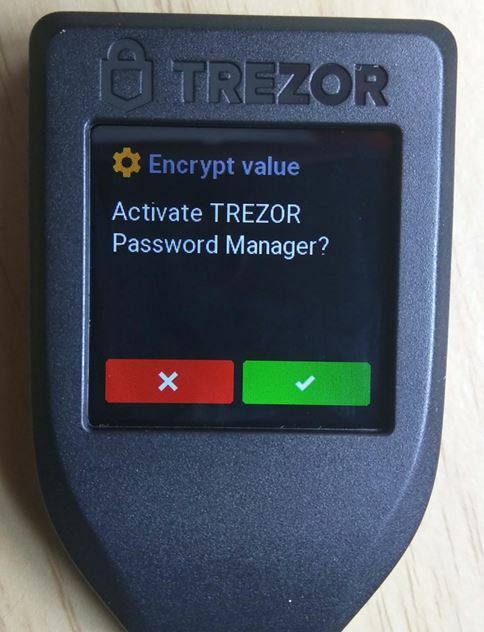 The Trezor Model T also runs on a firmware dubbed ‘Trezor Core’. This’ll make it easier for the Trezor Model T to support more cryptocurrencies (and expand its functionality). Interested in more details? Check out this post. 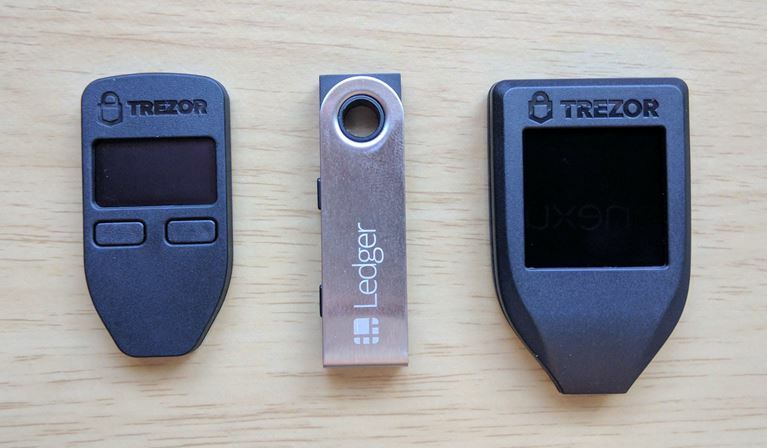 The most popular and well-recommended Trezor Model T alternatives are the Trezor One and Ledger Nano S.
But honestly? There are two excellent alternatives you should check out. Coldcard (super-secure bitcoin hardware wallet). Even though the Trezor Model T is great, is it really worth the extra £64 / €72? Initially, I didn’t think so. But by the time I’d finished writing this review, I’d changed my mind. The touchscreen makes it easier and more intuitive to use. 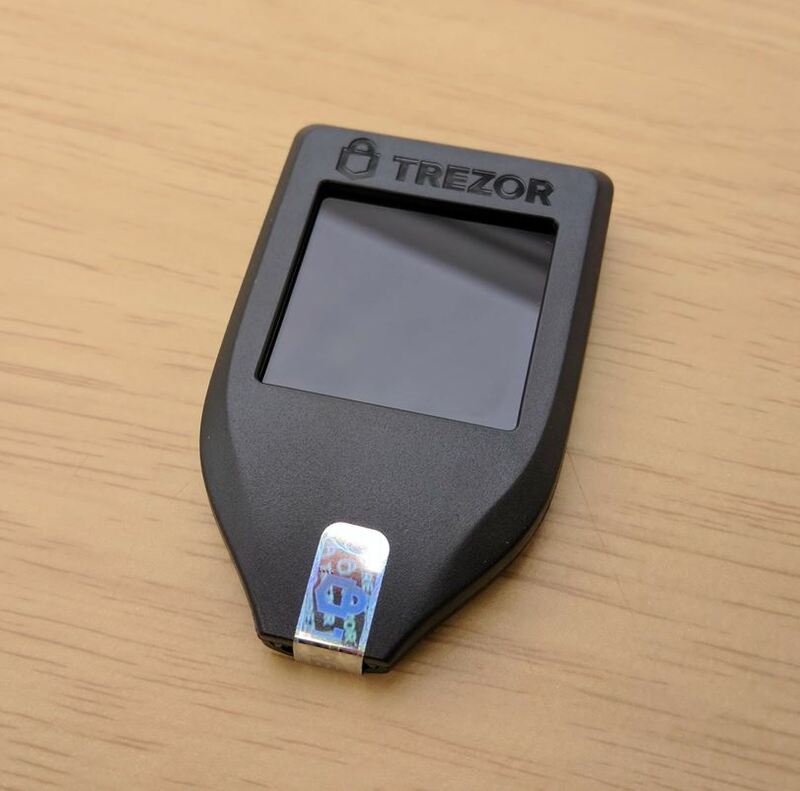 The Trezor Model T will begin to support popular cryptocurrencies which the Trezor One doesn’t – like Ripple (XRP) and Monero (XRP). 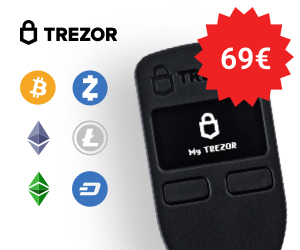 If you’re buying your first cryptocurrency hardware wallet, it makes sense to future-proof yourself by buying something like the Trezor Model T. Because it uses a developer-friendly operating system, it’ll probably get more altcoin support than the Trezor One. CoolWallet S (mobile hardware wallet). What do you think about the Trezor Model T? Is it worth the extra dough? Let us know via social media – Twitter, Facebook or Google+! Posted in Features and tagged hardware wallet, trezor, trezor model t, trezor t.